I lived in St. Louis when the "poker craze" of the 2000s hit. A lot of the guys at my LGS took to going to the casino boats not far from the shop to get in on the action. We'd also occasionally have nickel-ante poker night at my friend's place. It was fun and being just a nickel per game, if you lost $10 over the course of the night, you really lost badly. We'd play all different sorts of poker-style games. 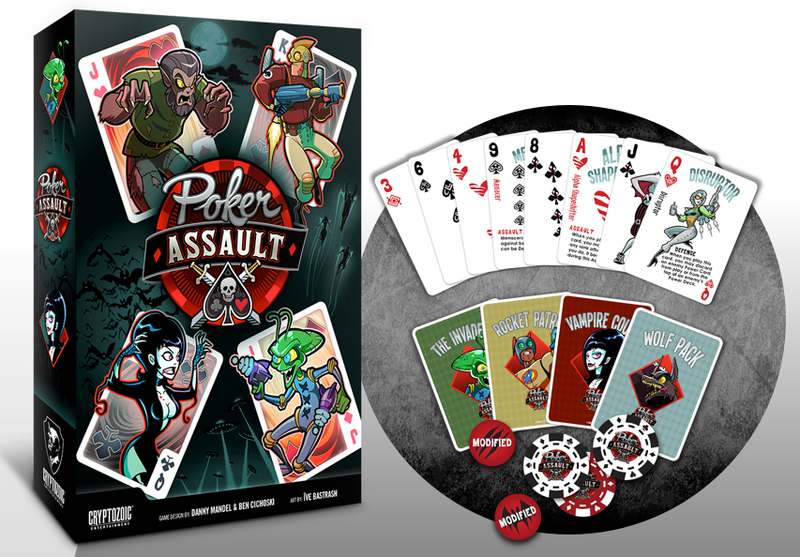 Well, if I got everyone together, we could possibly play Poker Assault, a new card game coming out from Cryptozoic tomorrow. In the game, players have their own set of 52 cards. You get your initial hand of 5 and play one card from your hand and then draw a card. The object is to create poker-style hands and use them to attack your opponent. The more powerful the hand, the harder to defend against. Get your assault through and deal damage to your enemy's life total. Get them down to zero and you're the winner.